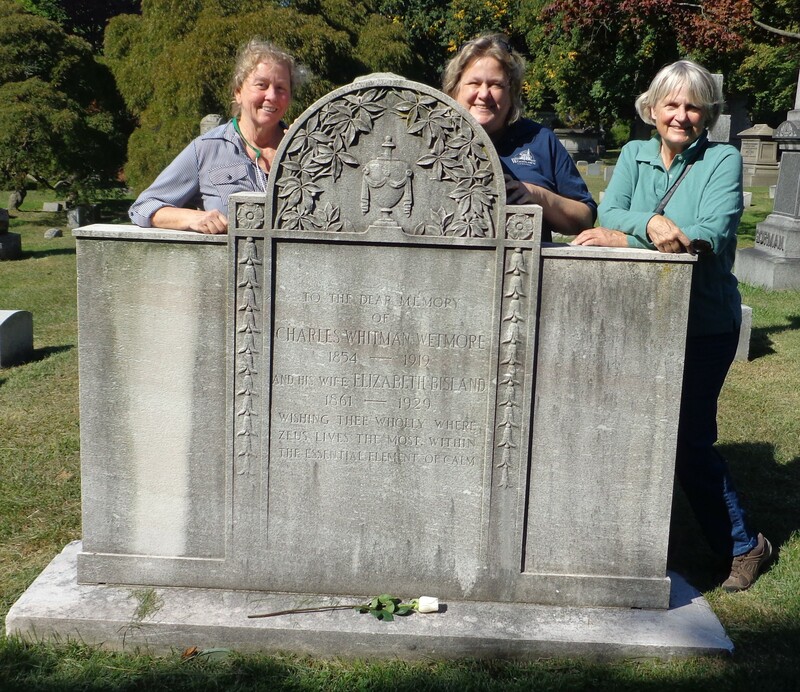 (l to r) Alice Robbins-Fox, cemetery historian Susan Olsen and Sally Emery at Elizabeth Bisland’s grave. 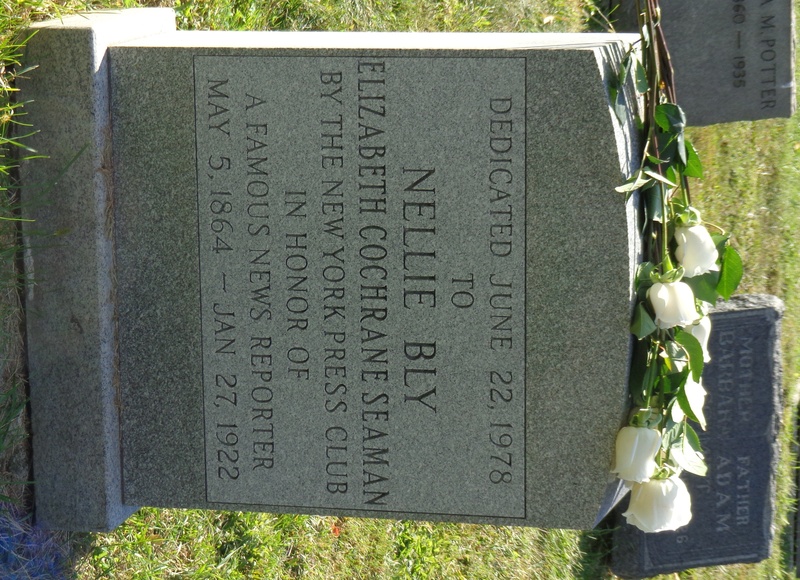 After following Nellie Bly so intently around the world, I wanted to visit her gravesite when I arrived in New York City to pay my respects. She is buried in Woodlawn Cemetery, a National Historic Landmark in the Bronx. Elizabeth Bisland, who was circling the globe at the same time as Nellie, is also buried at Woodlawn along with newspaper magnate Joseph Pulitzer publisher of the New York World, Elizabeth Cady Stanton, Duke Ellington and many other notable people. My friends Alice and Sally and I were met by cemetery historian Susan Olsen who took us by car for a tour of this fascinating burial ground stretching more than 400 acres and home to 300,000 graves. We passed the tombs of America’s most-loved people, some adorned with Tiffany glass. The first stop was at Elizabeth Bisland’s gravesite where I laid one of the 12 white roses I brought for the occasion. 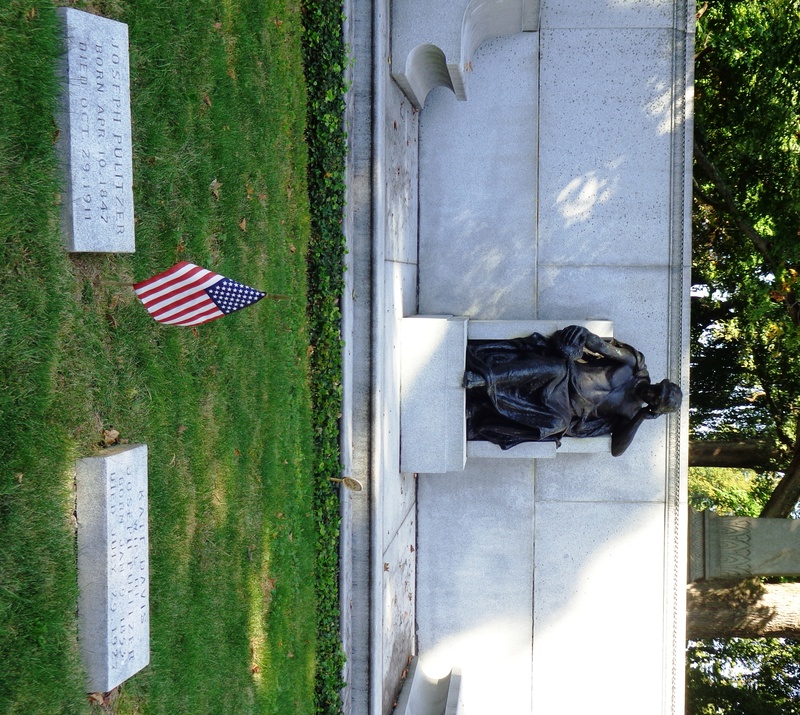 Our second stop was the tomb of Joseph Pulitzer, Nellie’s boss at the New York World. He built a newspaper empire from scratch. It was his idea to send Nellie to the asylum on Blackwell’s Island to uncover the abuses that mentally ill women suffered. That story resulted in sweeping reforms in the care of mentally ill people. At last we were on our way to Nellie’s tomb — plot 212, section 19 in the Honeysuckle Lot. It’s where many victims of the influenza epidemic of 1918 are buried, according to Susan Olsen. Nellie’s was one of the few graves in the Honeysuckle Lot that boasted a headstone. But it wasn’t even erected until 1978 when the New York Press Club dedicated it ‘in honor a of famous news reporter’. To me, Nellie Bly was so much more than a famous news reporter. She not only paved the way for women in journalism; she pioneered investigative journalism – the kind of reporting that brings about change and reforms….and makes the world a better place. When most women were relegated to the home, she travelled the world on her own with a small gripsack and the clothes on her back. With that in mind, I laid the 11 remaining white roses on her grave. I’m not sure whether it was the discovery that she was buried in a pauper’s grave unmarked for 56 years, or if this visit represented the culmination of a special journey for both Nellie and I, but I was overcome with emotion. Rest in peace Nellie Bly.